Last Updated: Friday, 14th October 2011. Listed below are most of the features provided in Exodus Viewer and the names of people credited for these features. Should any information be found inaccurate, please let us know on the forums or via. staff AT exodusviewer DOT com so that we can correct it. Please note, this page is rather out of date and will be updated this month. Ever just wanted to pop through your gestures folder and see which gestures are active on what key binding, without having to open them? Turns out, Exodus does this out of the box. Work on this feature can be attributed to Ayamo Nozaki. Found under the Exodus preferences sidebar, under the "interface settings" category, you'll find a slider that allows you to adjust the transparency of the bar at the bottom of your screen. This is where our post processing effect settings are handled, you can adjust post processing effects on the fly to set moods of a scene with features like HDR, even export your work and hand it around for others to try out. This feature allows you to quickly count the number of avatars in a region on the world map. Now, you'll be stuck in always run forever, well, at least till you disable it. When entering appearance, the camera wont wizz around, and unsit your avatar assuming you were sitting down in the first place. You can find the settings for this under the Exodus preferences sidebar, under the "various settings" category. Work on this feature can be attributed to NaCl Viewer & Chalice Yao. Now, avatar tags will color depending on the color they are marked on the minimap. You also have various settings on setting default hostile/friendly colors, and various other options under the Exodus preferences sidebar, under the "minimap settings"? category. If textures are failing to load, after enough fails, your client will request the texture from the simulator instead. Work on this feature can be attributed to Firestorm Viewer & Ansariel Hiller. Vaalith did a great job with this feature. Rather than uploading a temp-texture, you can select a texture from your hard drive, and use it within the client without even uploading it! The feature also allows you to automatically update the image every time it changes, very handy! Work on this feature can be attributed to Vaalith Jinn. These two settings allow you to disable broadcasting of your camera location to others, and to yourself. This allows you to keep the avatar-camera animation locally, without letting people know what you're looking at. You can find this setting in the Exodus preferences sidebar, under the "various settings"? category, under the "camera"? section. Various chat commands, they're all found under the Exodus preferences sidepanel, under the "chat command settings"? category. Scriptless, no impact on the region you're standing on, and even has a ZHAO or Oracul notecard importer. Work on this feature can be attributed to Zi Ree. The bog standard, well, maybe a little bit more fancy behind the scenes, client detection (which shows up in peoples tags). Work on this feature can be attributed to NaCl Viewer & Zwagoth Klaar. Does what it says on the tin, press expand, every folder in your inventory will open, press collapse and they'll all close. Work on this feature can be attributed to Firestorm Viewer & Zi Ree. Ayamo added some handy dandy little icons to the bottom of the inventory, rather than the original buttons. "Okay, now I need you to enable hidden files, browse to C, users, username, app-data, Exodus Viewer, copy these files, e-mai..." Actually, now all you need to do is tell us your Second Life name, so we can look up your crash dump that was sent to our servers. No more complicated steps to give us the information we need to fix your problems. Work on this feature can be attributed to Ash Qin. Allows you to fine tune adjustments, while using the up/down arrows if you hold one of these keys, it'll adjust the incremental value. Work on this feature can be attributed to NaCl Viewer. Pick a texture, or a preset from the drop-down and replace your cross-hair with something a little more fancy. This features especially useful, since it doesn't require a script checking if you're in mouselook multiple times a second. Found in the people sidebar, a little neat radar that tells you the names of everyone around you, if they're above or below you, their distance and even their active group title, which is especially useful during Second Life Military Combat. Oh, and just to note, in future we will be adding a expanded radar, with all the other bits of information people seem to be interested in. As you would expect, right click an inventory item, select "cut"? from the inventory menu, and then paste it somewhere else. A lot easier than dragging an item from one end of your inventory to the other. Unknown creator, please let us know! Many people like light chocolate, but there are those who prefer dark chocolate and this is an option for those who like the consumption of high-cacao-content and cola, the dark side shall prevail! Found under the manage menu for objects, derender allows you to get rid of pesky things obscuring your vision, useful for photos, or just hiding something you don't want to see. If you've derendered something you didn't mean to, the best course of action is to open the quick tools (the little gear button in the bottom bar) and drag draw distance all the way down to zero, give it a second then raise it back up, anything you've derendered should reappear! Before, your mouselook camera would be limited to a certain angle, now, it's a lot less limited, especially while sitting down on vehicles. Work on this feature can be attributed to Jeremy Duport & Ayamo Nozaki. Some of those pesky extras are a drain on your frame-rate, disable the ones you don't need, and keep them disabled! Great to keep a track on who is entering/leaving your region, be the first to spot an attacker! Keep an eye on the latest news and updates from the sidebar, also get version notifications, and in future a lot more! We're hoping on expanding this fancy little page a lot more in the future, keep an eye on it! Work on this feature can be attributed to Brins0 Blackheart. We decided to throw all our settings in the sidebar, where they'd be easily accessible, and quick to change. Sometimes it takes other people rebake for this to popup, but we've added a fancy method of detecting other Exodus users version numbers! Really handy for keeping an eye on your buddies, making sure they're up-to-date. Work on this feature can be attributed to Ayamo Nozaki & Ash Qin. Handy for those precision, down to the decimal adjustments. Work on this feature can be attributed to Kadah Coba. “Nam’s...” Presets: Unknown creator, please let us know! “CalWL” Preset: Thanks to Caliah Lyon. Want brighter greens, deeper blues, and more subtle reds? Our color correction shaders allow for you adjust the color, and exposure, of the scene, independent from the region's windlight settings. Work on this feature can be attributed to Geenz Spad. For some reason in vanilla 3.0, pressing the "/" key doesn't bring focus to the chat-bar and let you start typing, but in Exodus, it does! Ever noticed how deferred rendering tends to lack anti-aliasing? We've fixed that with our own "Fast approXimate Anti-Aliasing" shaders. It runs faster than real anti-aliasing! The usual, even has the original key-binding, CTRL+ALT+S. You may have to enable the advanced menu (by pressing CTRL+ALT+D) to use that shortcut though, as the menu item is stored there. Great for combat, anyone not in your field of vision is represented by a handy little arrow that will stick to an edge of your screen giving you an approximate location of them (behind you, above you, to your right or left.) There are various settings available for enabling or disabling friendly/hostile arrows, or the range it'll pick avatars up within. You can find these settings in the Exodus preferences sidepanel, under the "interface settings"? category. Get annoyed by your inventory randomly scrolling up to the top of the page? Well, that should be fixed now thanks to Kitty Barnett's work on sorting that out. Work on this feature can be attributed to Catznip Viewer & Kitty Barnett. Currently the best JPEG2000 encoding and decoding library by Kakadu Software, this library is used by Linden lab in their official viewer, but often not accessible to TPVs. This library has a tendency to bring better performance than the OpenJPEG library. Big thanks goes out to you guys, for getting the project started. Obviously this feature can be attributed to Kakadu Software. Numerous changes were done to the underlying system to get the viewer to build on a more modern compiler, with certain optimizations as well as correcting a few things to be less assuming about what version is available on the build system. Thanks goes to Ash Qin. On Linux operating systems, package management systems are charged with the task of organizing all software installed on a system. This includes installation, uninstallation, updates and it is all extremely automated. Linden Labs and TPVs are not normally known to produce packages or repositories for their software, which leaves Linux users with a rather poor experience. 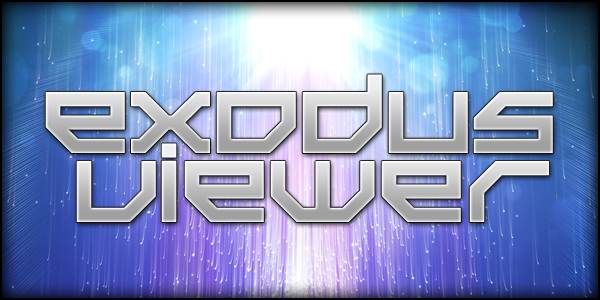 Exodus Viewer provides repositories and direct links to install packages for our Linux users. It's something small, you're wracking your brain trying to figure out something out in Exodus, you just need a push in the right direction. Well fortunately you can just go to Help, Exodus Support Chat and you're online, talking to some pros of the Exodus Viewer community who can help you along. Heh, there is no need for Boot Camp now! Thanks goes to Geenz Spad & Mimika Oh. Want to monitor common region statistics without all the bloat of the regular statistics window? Help, Minimal statistics, drag the window where you want it, double click. Bang! Just the text, none of the text or window bloat! World, Minimal radar, drag where you want the window, double click. Boom! Names, distance, no mess, no fuss. Just get it on. The minimap has been revamped! There's now rightclick menus, color coded menu items, and various features tucked away there, you can even center the minimap to the region, which has been a big request in the combat community, you can mark multiple avatars at once, raise/lower your selection size, by holding shift and scrolling up and down while your mouse cursor is over the minimap, and more! More inventory items now have the option to "add"? them. Work on this feature can be attributed to Firestorm Viewer. As like various other third party viewers, you can also bind a gesture to almost any key on Exodus too. While your cursor is hovering over a region on the minimap, various extra bits of information will display, such as the number of avatars in the region your cursor is over. Offline messages received in Exodus are in PDT/SLT time, rather than your local time. Need to tweak a common setting quickly? Click gear box, click option, go! No endless windows to go through. In an ever changing world like Second Life, where numbers can change significantly from day to day, use the raid advisor to figure out numbers on multiple regions at once to plan where you can find the most action to fight in. In mouselook, while rolling over an avatar your cross-hair will change color, depending on your cross-hair settings, which are located in the Exodus preferences side-panel, under the "interface settings"? category. It will also display the distance between you and them. Really handy feature for any first person combat in Second Life. Planning advanced tactics down to the last moment? Perfect timing needed for an operation? There is an ancient method used in all of these, it's called "counting the seconds"?. With the seconds now included in the default clock, this couldn't be easier. While selecting multiple objects, you can mass rename/adjust the description to all of them at once. Work on this feature can be attributed to Satomi Ahn. Got a attachment that is hard to rightclick and select? Well, wear it and rightclick it in your inventory, select "edit"? and you'll automatically open up the build menu and select said item. Sith or Jedi? Dark side or the light side? Do you just tread very close to the line and switch back and forth? Now you can choose a theme to reflect your nature, so you can script in comfort on your preferred side. Various little tweaks and changes, to make things a more tidy, and more Exodus themed. Great little feature, while you're chatting, you'll know if you misspell something before you hit enter, this feature will draws a red line under it! Not sure how to spell that word correctly? Rightclick it, you'll be given a bunch of suggestions, hopefully one of them will be the word you're looking for. Before, you couldn't automatically search notecards, but now you can! Work on this feature can be attributed to Satomi Ahn & Kitty Barnett. Thanks to "The Good Book". Great for combat, avatars not loading? Well, they'll be a cloud as usual, but rather than a white cloud, it'll be highlighted a color that is recognizable, hostile/friendly dependant on your minimap settings. As it says on the tin, you can zoom as far out as you want now. Useful for various things, scripts, databases, etc. Ensures that the lab's handling of version numbering will not miss identify new versions of the viewer as older versions. Ever wanted to poke at something you're wearing in your inventory, but you didn't want to go through the long process of locating where it's stored to poke at it? Well, now you have a convenient to access "˜worn' tab in the inventory panel, no searching, no fuss.